To date, Hyundai Hope on Wheels has awarded more than $1.2 million in funding to pediatric cancer researchers at Monroe Carell Jr. Children’s Hospital at Vanderbilt. The company and local dealerships began their partnership with Children’s Hospital in 2007. Friedman is one of 25 recipients of this year’s Impact Grants, given to pediatric oncology departments at select children’s hospitals nationwide. 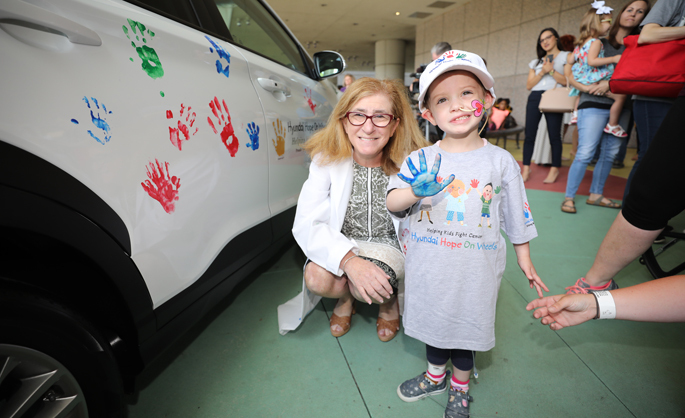 Representatives from the automaker and local dealerships joined Children’s Hospital leaders and some of Friedman’s patients to celebrate the grant award at a “handprint ceremony.” During the event, the children dipped their hands in paint and placed their colorful handprints on a white Hyundai Santa Fe to represent their personal stories of courage and hope. Since 1998, Hyundai has awarded more than $145 million nationwide toward childhood cancer research in pursuit of a cure.